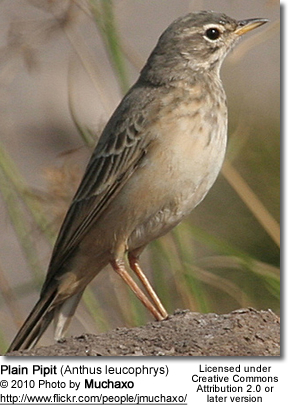 The Plain Pipits (Anthus leucophrys) occur naturally in Africa south of the Sahara Desert. They inhabit open habitats, such as short grassland and cultivations. The Plain Pipit is a large pipit measuring about 17 cm in length, including its tail. The plumage is mostly grey-brown, faintly streaked bove and pale below with light streaking on the chest. It has a strong white supercilium and dark moustachial stripes. The legs and tail are long. The bill is dark. Males and females look alike, but juveniles have warmer brown upperparts. Similar Species / Vocalizations: The Plain Pipit resembles the wintering Tawny Pipits, Anthus campestris. However, the Plain Pipit has a darker plumage than the Tawny, and stands more upright. It has a different call as well. The Plain Pipit's call is a characteristic "ssissik" call, while the Tawny Pipit's is a "tchilip". Plain Pipits place their cup-shaped nests on the ground. The average clutch consists of 3 eggs. Plain Pipits mostly feed on insects.